At our most basic, we’re a marketing and public relations firm. Some may call us communicators or marketers, others call us advertisers, and still others think of us as digital strategists. Whatever you may call us, what we do is shape thought. Think about the origin of thought. Every thought we have, every glimmer of an idea starts with a spark, whether it’s something someone says, an image we see in front of us, or pure silence. Thoughts pop into our heads at every moment. It’s up to us as communicators to take those thoughts and turn them into something tangible, something actionable, something big. 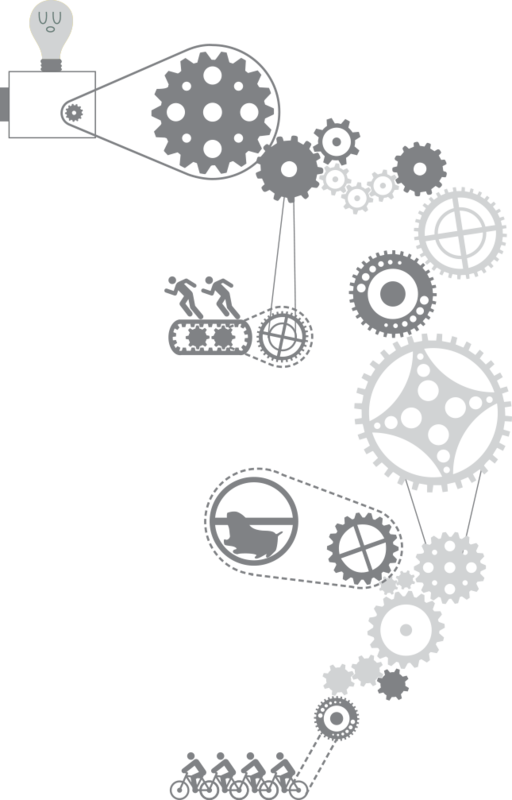 We’re thoughtful about how each marketing strategy, tactic or activity works with the other, just like gears in a machine. If one gear stops turning, the whole machine stops working. Philosophy’s integrated approach to marketing and communication is what makes us successful and ultimately, it’s what makes our clients successful. Philosophy can implement just about any marketing initiative a client throws our way. Our brilliance lies in the thinking behind the work. Will pretty pictures and flowery words really make a difference in your business? If so, we’ve got pretty and flowery down. But if your communication challenge is deeper and more complex, Philosophy has the brain power to go below the surface and discover the root of your challenges and come up with creative ideas that mean real results for you and your business. Within marketing, Philosophy specializes in brand development, advertising, and creative design. We build integrated campaigns, thoughtfully considering and using appropriate tools to create a marketing campaign that works. Philosophy sees marketing and public relations as distinctly different business functions, but completely dependent on the other. One can’t exist without the other, and one can’t produce amazing results without considering the other. To use a fancy word, they’re symbiotic. Philosophy isn’t just a marketing firm that happens to do public relations. Nor are we a public relations firm that happens to do marketing. We’re a firm that believes and practices the integration of both functions. Within our public relations practice, Philosophy specializes in key message development and training, traditional and digital media relations campaigns, and event concepting and promotion. In today's highly stimulated, technological world, marketing and communication campaigns must integrate digital components to be effective. Whether a campaign should play out on an existing website, engage bloggers, communicate with customers on social media, or find new customers using search engine marketing, Philosophy knows how to reach your target market online or off. We have created a digital strategy practice that starts with a client's website. If you're looking for a completely new site or a revamp of an old one, Philosophy delves deep into your business's digital world, identifying gaps and opportunities. Whatever your digital goals may be, we have the technological know-how combined with a firm grasp of communication fundamentals to build everything from a new website to a full digital campaign. Within our digital strategy practice, Philosophy specializes in developing websites from concept through launch, creating and launching a company blog, and implementing social media campaigns.